Something 2 Brag About brings you personalized gift certicates to make your gift giving easier. We have many denominations to choose from, so you will always be able to give the perfect gift. JUST CAN'T DECIDE ON THAT PERFECT GIFT? 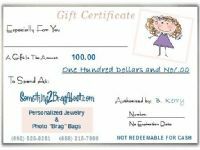 For a Birthday, Anniversary or Baby Shower.... That special someone would be delighted to receive a "Something 2 Brag About" personalized gift certificate. We can send a gift certificate directly to the recipiant. Gift certificates are good for all merchandise in our store, including, but not limited to our mother's bracelets, baby bracelets, wedding bracelets, grandmother bracelets, brag bags and more.